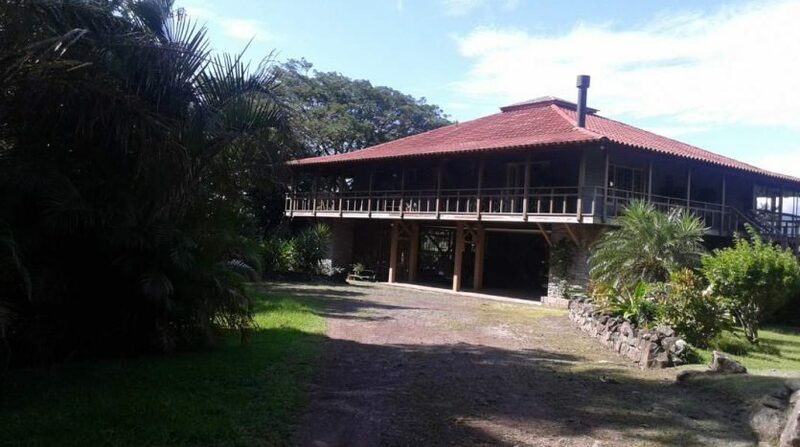 House Right on the Lake, Super 3-volcano view (Arenal, Tenorio, Miravalles) on 3.2-hectares of pasture and reforested property with stream, multitude of animals-birds-monkeys-sloths-all kinds of wildlife at your doorstep- lush landscaping here with fruit trees. This is excellent location close to all major highways and attractions and an ideal BnB spot. Close to Tilaran and Nuevo Arenal-hot springs. 1.5 hours to Liberia Airport and Guanacaste beaches. Close to Lake Arenal attractions like Toucan Catamaran and Kite Surfing and Wind Surfing and Fishing. Main floor: This home was expertly built by gifted Bucks County Pennsylvania Builder and you do not find this quality of construction and design planning everyday here in Costa Rica. Most of the higher grade materials used in its construction were imported. Size: 160 m2 with atrium, spacious LR, DR, custom kitchen, master suite, 2 BRs with shared bath; surrounded by 160 m2 veranda, partially glassed accessible from all rooms through French doors PREMIUM LARGE OPEN INDOOR OUTDOOR LIVING IN A PERFECT CLIMATE. Exquisite interior finishing, rich tropical hardwoods throughout. Ground level includes very secure bodega/workshop, office, unfinished bath – space suitable for converting to apartment; laundry with potting/animal grooming table; parking for 3 vehicles; mechanic’s pit. Extras: on-demand gas hot water, deep-water well, fruit trees, fire sprinkler system, living room and master bedroom suite fireplaces, central vacuum cleaner, security lights and cameras, 75-pound capacity dumb waiter, full-house surge protection, remote-controlled front gate, includes custom furniture and fixtures, ample closet and storage spaces. Superior steel-frame construction, double roof, insulation, excellent ventilation. Wi-fi. Property composed of 4 separate lots. Excellent expansion potential–much room for building more houses or rental units/casitas here.